Our school contains a passionate group of teachers, parents, and administrators that dream of building an outdoor classroom at our elementary school. Since I love dirt, plants, and kids, it’s fitting that I am elbow deep in this project. Bringing this vision to a reality takes years of planning and fund raising from a community of dedicated people. One method of fundraising has been a plant sale. Several times I was asked, “Which one do I have to plant every year?” I have been around plants for as long as I can remember and I assume everyone knows the difference between an annual and a perennial. It is not a silly question and I can understand how easily the terms can be confused. Annuals will only grow in your landscape one season. However, during that season they will bloom continually, providing a summer of color. Perennials return year after year. Their blooming period is much shorter than that of an annual. I plant both! Annuals and perennials have so many different characteristics: color, texture, bloom time, foliage, size, etc. If you choose to plant only annuals or only perennials, you are missing out on some beauty and satisfaction. Either way, we purchase flowers every year to add a depth of “curb appeal” to our home landscape. To make the most of our purchase, it’s important to maintain the health of the plants. Plant them where they will thrive, sun or shade, depending upon their needs. Water and fertilizer are also required to keep the plants blooming and blooming big. Almost all plants in the garden center contain a label. Save the label and follow its instructions for the life of that plant. It will tell you the plants sun and nutrient requirements. 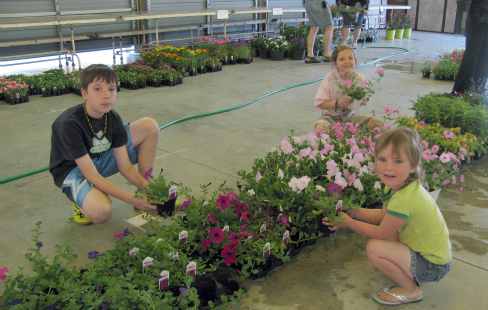 We had many supportive patrons visit us during the plant sale, purchasing both annuals and perennials. Our school’s outdoor classroom is well on its way, and just for the “cause,” I bought all the leftovers, and again find myself elbow deep in another project. Do You Preserve Your Harvest? Annual lives for only one season and perennial plants live for many seasons. Daffodils are perennials. Before planting these in your garden it is important to know which are perennials and annuals.